Strict Themes is a renowned company which has build WordPress themes and plugins for more than ten years. 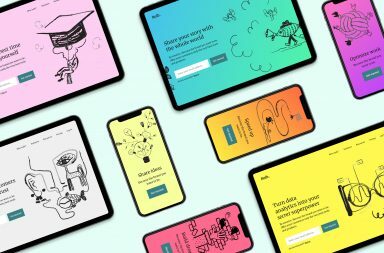 Their aim is to create amazing themes that have outstanding features and are easy to use and which allows the building up and setting up of monetized websites. They have ten categories of themes which have received a positive rating from customers. Among the many reasons why customers choose StrictTheme’s themes is because they make a valid and readable code and also provide regular updates for the themes. They also work hand in hand with the customers to ensure that their preferences are meet. Below is an outline of the amazing themes. 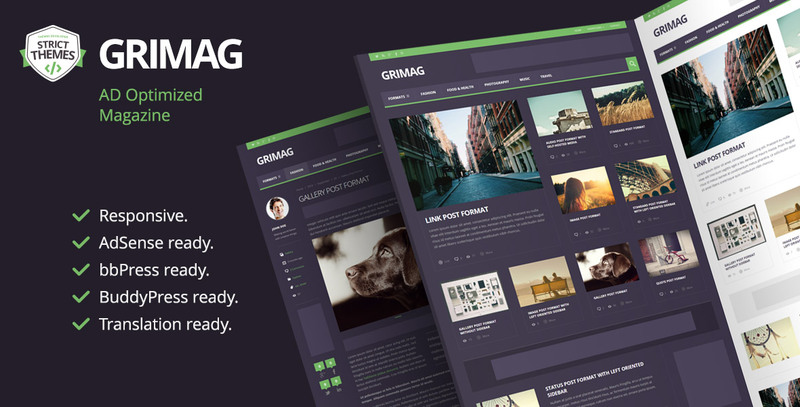 Grimag is one of the most selling themes that StrictThemes has since it has unique features. 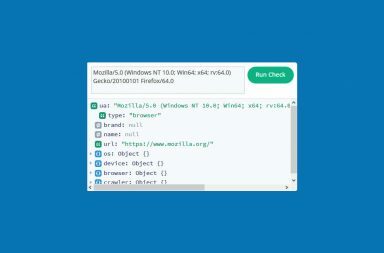 These features include the ease to customize the color scheme, excellent design, coding and impeccable support. The one feature that was very much anticipated is the built-in solution for AdSense on responsive layouts. AdSense protects the responsive design from breaking and it is the largest ad platform in the market. Grimag alongside AdSense brings out a magnificent layout which ensures that functionality is upheld irrespective of the device or the screen size in which the theme is opened. The theme is tailored to oversee ease monetization, and it works well with different types of plugins. The advantage of obtaining this theme is that it has a clean layout and different formats which have different content. The AdSense works out perfectly since it places all the ads in visible locations which lead to more clicks. 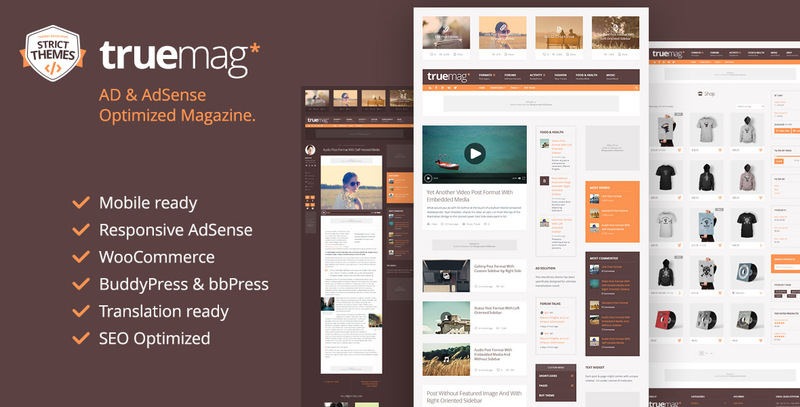 Truemag theme by StrictThemes also has AdSense which guarantees more advertisements, more traffic, and more profits. The design is magnificent and has 4 slats where one can post important posts above the top menu of the website. 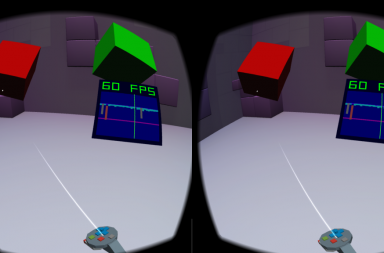 The layout adapts to whichever screen a visitor is using irrespective of whether it is a big or a small screen. This theme has awesome support for WooCommerce which gives room for you to create an online store in just a few minutes. You don’t have to worry about whether the themes will be clear on your mobile phone since the theme is designed in a way that the top boxes will still be visible on your small screen. 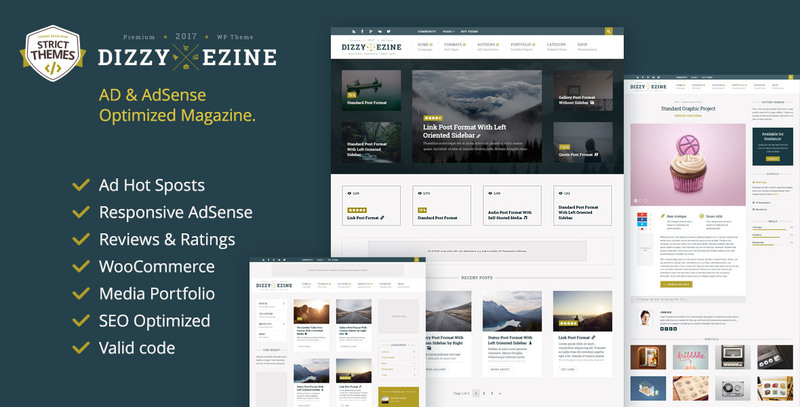 The DizzyMag theme is the trendiest theme that StrictThemes owns. The layout is designed to allow you to get 5 posts highlighted on top with pictures. The theme is suited for creative entrepreneurs since using this theme is easier to catch the reader’s eye. The Dizzy has plenty of advertising placements and just like most StrictTheme’s product; it has responsive AdSense. Additionally, the theme has a sortable portfolio with 3D effect and also supports Woo Commerce which makes it an excellent choice for affiliated marketing websites. The page layout of this theme comes with two different templates. Thus you can either choose the default layout which has 5 sticky posts or the other layout which places the most recent posts in 8 boxes in the center of the page. 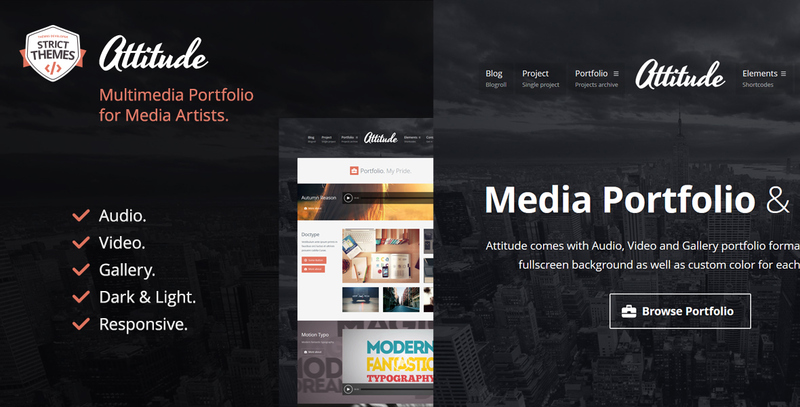 The Attitude theme is preferable for multimedia artists who wish to showcase their art. It is a great option for media publication who aims to focus on the visual aspect. This is because the theme has three portfolio formats which include; audio portfolios, video portfolios, and gallery portfolio. Attitude theme is perfect since it allows you to display your creativity and art and still have an incredible layout that responds effectively and has a great look on your screen. The amazing feature about this theme is that you can change the design as you so please. Moreover, the themes have high-resolution graphics which is a perfect match for multimedia artists who wish to showcase their creativity. 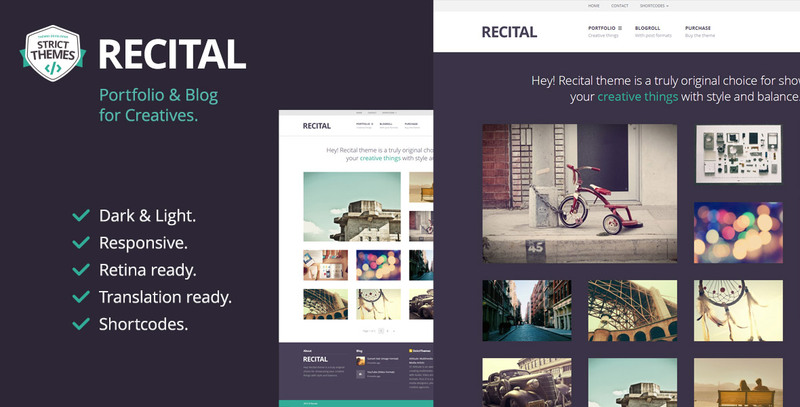 StrictTheme designed Recital theme on the basis of a theme made by artists for artists. The theme is perfect for an individual who wants to showcase their artworks such as; architecture, fashion, digital painting and illustrations. The theme is designed to enable you to use your creative to outline your art. The sidebars are easily customizable which gives you the opportunity to create different sidebars that will suit your preference for every page in your website. 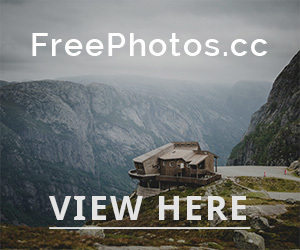 For every image you click, it gives you the post title and subtitle which is a unique way to outline your artwork and still show the details of the art. 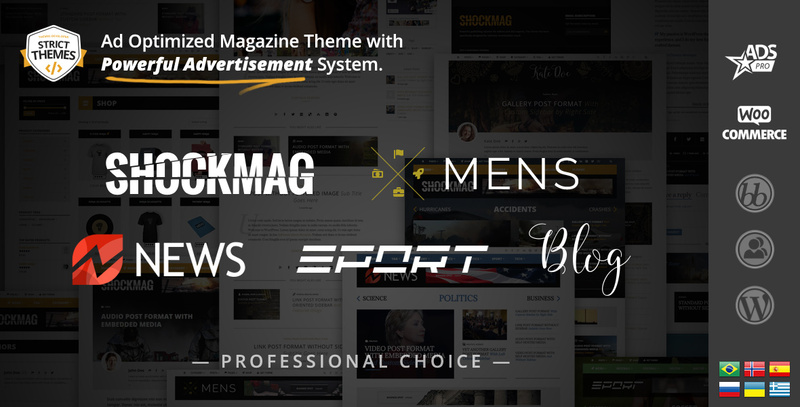 StrictThemes have designed this Shockmag theme in a very outstanding way. For instance, the fact that the slider is not limited to a slider, allows the website to have different sections where the user is able to slide through them and the background page also changes automatically. The content slider is available on the front page and category pages. The theme has ADS Pro for free which is a multi-purpose word press Ad manager that allows you to manage, sell and display your advertising space in a way that outdoes other plugins. It also enables you to monetize your website. You can also improve your visitor’s experience on the website by building a custom mega menu by use of any widgets. 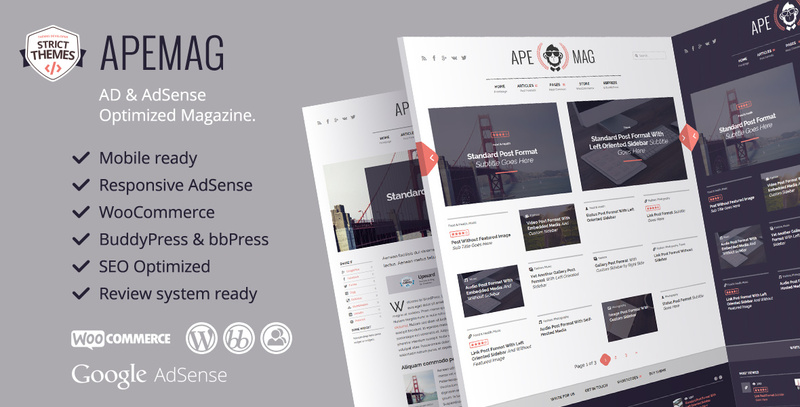 The Apemag theme is recommended for websites that require a review system. The theme is bespoke for ultimate monetization where there are plenty of advertisement areas which are placed in the “hot spots.” With this theme, you do not require a related image for your post since every post will look perfect even with no image featured. The theme is designed with SEO best practices in mind. Therefore you are guaranteed to have numerous visitors to the websites. Upward is the most unique theme that StrictThemes owns. Upward theme is a recommendable choice for showcasing your illustrations and artworks. The themes give a different and outstanding outlook of your website. The theme has a leaning motif which is catchy and will be visible regardless of the device you using. 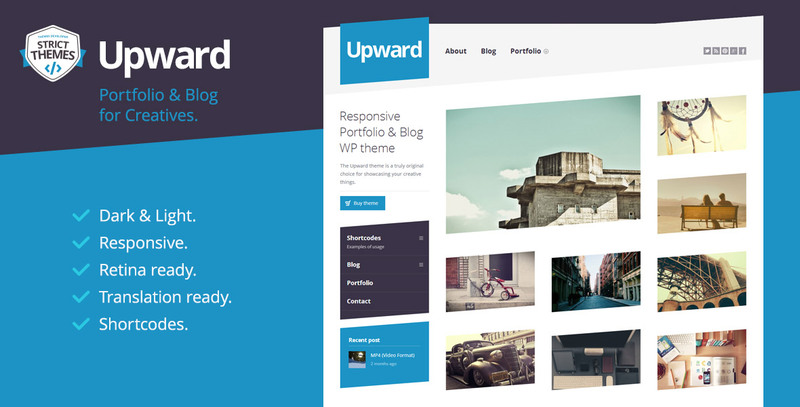 Upward theme is among the best WordPress themes. The StrictOne theme is designed in a manner that makes it simple to use. It is less complicated and has minimal artistic thus the main focus is on the content. The theme comes with five portfolio templates which give you the flexibility and option to showcase your ideas in the best way possible. The theme is also responsive and HiDPI compatible thus looks great on all screens your phone included. 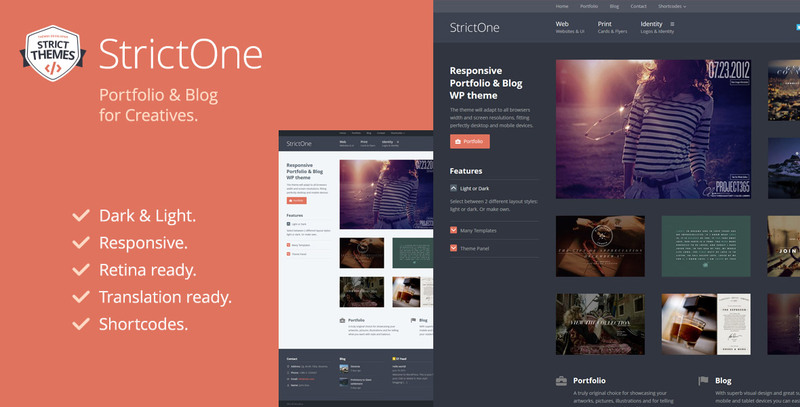 StrictOne gives you the option of two layout styles; light and dark both of which are amazing. 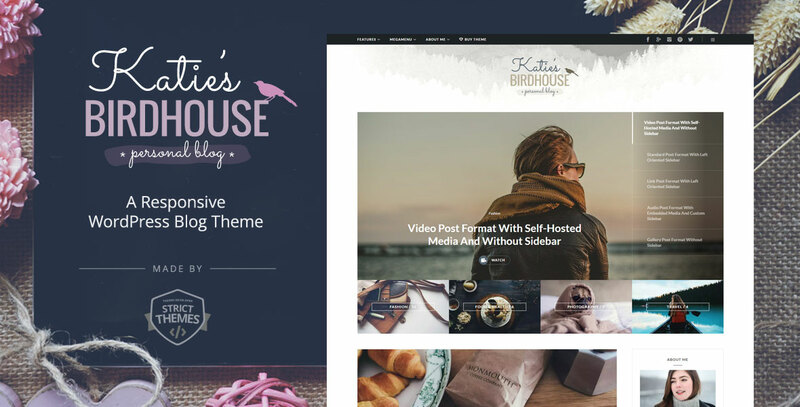 If you operate blogs or introspective websites, then the BirdHouse theme is the best choice for you. The theme displays your best posts as something special and highlights top categories below the slider. A recent post is market as special and has two blog layouts i.e. Classic Blogroll and Elegant Blogroll which display blogroll in a sophisticated style. The theme also included different post formats for various types of content such as video, images, text posts and audio. All themes created by StrictThemes are fully responsive and look amazing in all kinds of screen sizes. With StrictThemes, you are assured of well-readable codes since they use PHP & JS code, and this is the reason why most professional developers prefer to use themes from StrictThemes. Additionally, the company has a diverse range of designs which ensures that it covers a larger industry thus there is a theme for whichever website you wish to create. StrictThemes provide instant updates; thus you are always informed about a new release, and an update is only a click way.